I arrived at my shoot the day before the assignment. I was in Marshfield, Vermont, close to St. Johnsbury in the Northeast Kingdom, and not far from the Canadian border. It was cold for the middle of October, even up there, and spitting snow. After settling into my motel, I drove to the town of Peacham, a place I had visited fifteen years earlier, looking for Vermont cheddar and maple syrup. 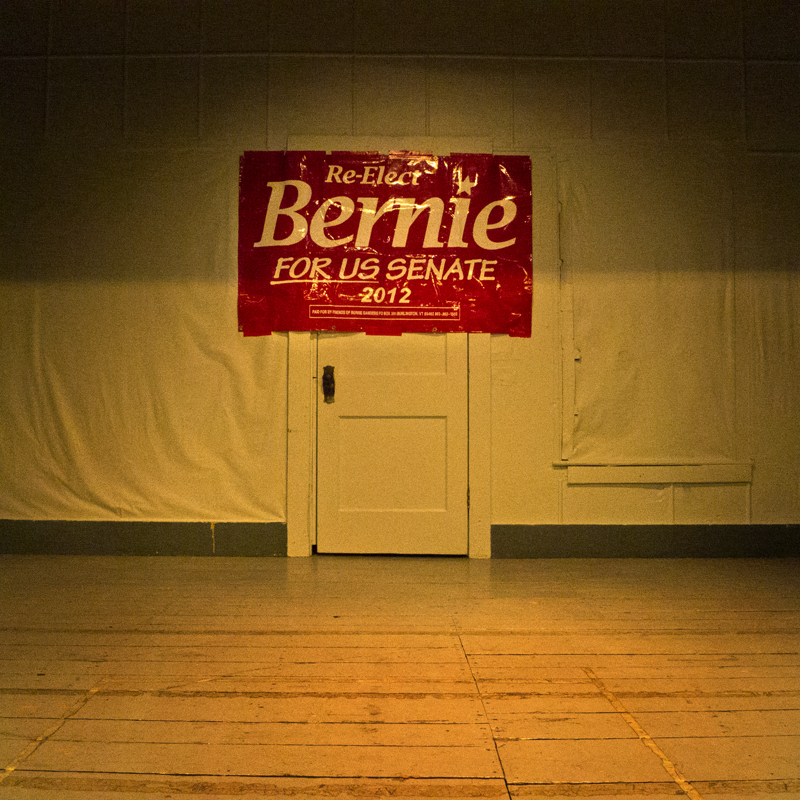 In a store I noticed a poster announcing a town hall meeting that night with Bernie Sanders, Vermont’s Independent US Senator. I follow politics pretty closely and I’ve concluded, like a lot of people it seems, that Congress is malfunctioning, not representing the people its supposed to serve, and only a pawn of big business. That said, I’ve always liked Bernie Sanders and thought this would be my only opportunity to hear him speak in person. So, I went to the meeting and wasn’t disappointed. 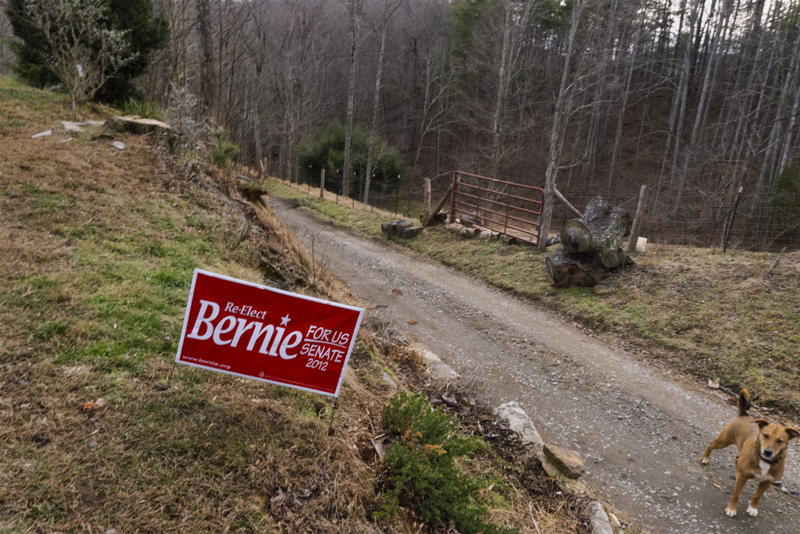 Sanders describes himself as a Democratic Socialist, a label that scares many people. But in reality, what that label means is he is more interested in the lives of his constituents, the common people, than he is in big business or moneyed interests. He consistently votes for environmental protection, workers rights, universal health care, and media reform. One of my favorite things about him is he was a carpenter for a time before he got into politics. He was also the President of the University of Vermont. At the town hall meeting, Sanders had chosen to spend his campaign dollars on food and provided a great, homey meal for everyone that showed up. While standing in line for grub, I met two women who both had sons that graduated from Warren Wilson College. For me, that was a sign I had come to the right place. The food was great and Senator Sander’s talk was the populist diatribe I was hoping for. I brought a yard sign home to the farm, knowing full well I couldn't vote for him, but hoping it would be a reminder of values I believe in.